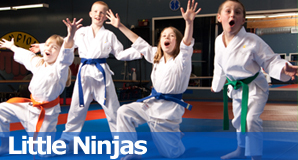 The Little Ninjas program is specifically designed martial arts program for children aged 4 to 6 years of age and focuses on the basic components of Martial Arts technique. 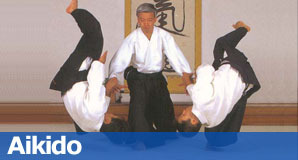 This approved course from The National Association of Professional Martial Artists focuses on building strong fundamentals, like Balance, Focus Skills, Chambering for Kicks, Blocking Technique, and Gross Motor Coordination and Skills, as well as attitudes such as Respect, Confidence and Discipline which will create a strong foundation for the martial arts, school and life. 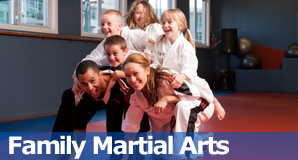 The classes are always high energy, educational and lots of fun for everyone. Book an exciting afternoon of fun Kung Fu. Birthday cake and lots of games! Your Kung Fu Birthday Bash is filled with specifically designed drills and games so kids of all ages with no experience can join in the fun! We provide the invitations, instructors, drinks and Kung Fu theme settings. We also do all the clean up! Remeber: Island Kung Fu Birthday Parties are $99 for Island Kung Fu Students! "My daughter’s confidence and self-assurance have increased enormously since starting Attending Island Kung Fu, and she has learned just how much she can achieve with hard work! The school has such a positive atmosphere. I am so proud of all that Elsa has accomplished and I cheered for her when she earned her Black Belt. Thank You!"